Every couple of months, and more often during the OutSeason, Coach Patrick, Coach Rich, and Race Director Brenda issue a challenge to Team members to keep them on their toes and beat any ruts people inevitably fall into. 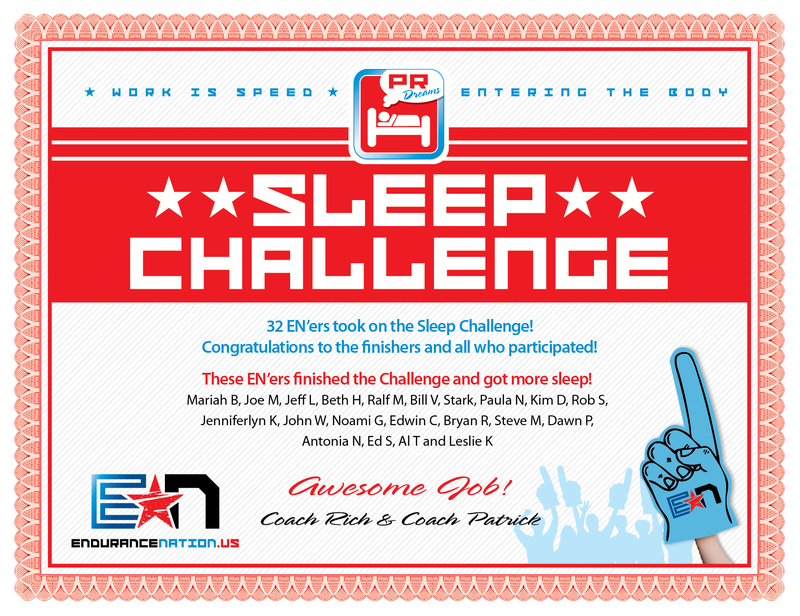 On January 1,2014 Endurance Nation issued a challenge to Team members: get more sleep. Proper sleep has been shown to be the biggest single performance enhancing resource that an endurance athlete can integrate into training. Report your progress in the Sleep Challenge Forum in the Member website. Stay tuned for our next challenge….and maybe you’ll join us next time! Sign up to receive the Endurance Nation Weekly Update newsletter, and get notified when we release the upcoming First Time Ironman ebook.